Ferguson – A Shadow of an American Civil War or Genocide? A Repeat Performance of Business as Usual | Giving You Strength for the Journey! As I sit in the quiet corridors of my safe, comfortable, spacious abode, I think about my brothers and sisters in Ferguson, Missouri who are on the frontline fighting to take back their neighborhood and community — just to protect themselves and their own –- the best way they know how. Many of them may not know how to be politically correct in roundtable deliberations or express democracy on a universal level –- at least by the standards of the world, who is now watching, and by those who taunt them for their alleged flaws. But what they do know is that, so many in America and around the world are experiencing fear, hate, pain, poverty, uneasiness, and injustices just like them. What Ferguson residents are experiencing is the constant degradation, disrespect, and utterly open destruction of their lives and the lives of their loved ones. While it angers me to sit and watch atrocious events unfold, such as the unexplainable shooting of unarmed 18-year-old Michael Brown, who was reportedly shot six times while facing and surrendering to Ferguson Police Officer Darren Wilson, 28, I realize that my anger is not enough to change a century-old mindset of doling out hate crimes against Black humanity. Nor is my anger enough to change the pain and hurt of Brown’s family and friends, or those who suffer, and have lost life by the hands of their perpetrators. And it is certainly not enough to change the racial tension felt in that community and the tensions around the world. If “gunning down unarmed Black men” does not come to an end, but is allowed to persist, and if my calculations are correct, nearly 20,000 Black men will lose their life in one year. This means that if one Black man in every state in this country is shot every day, 18,250 Black men will be eradicated. However, we know that a vast number of Black men are murdered every day across America. And if this eradication continues, in less than one decade, Black men will be almost extinct. Black women will have even less of a chance to procreate. There will be way less children to carry on Black American legacies. If we add to the number of daily shootings, 14 other categories that wipe out Black men and that cause their repeated absence from society, more than ¼ million Black males will be wiped off the face of the earth in just 365 days. And if this type of crime continues annually, within one decade, up to five million innocent Black men will be murdered — unnecessarily. Even as I write this, and although little details are known, a news report states that ‘a 9-year-old Black boy has been gunned down in the street.’1 Right before our very eyes, genocide is unfolding in slow motion. 7) Accidental death i.e., drowning, on-the-job casualties, etc. These classes of people do not include non-functioning individuals such as those undiagnosed, untreated, incarcerated, incapacitated, mentally disabled and debilitated by depressive actions. We have read and learned about other classes of people who were nearly eradicated. Many ‘Holocaust victims have had to rebuild after millions of Jewish people were annihilated by Hitler and German forces, who committed genocide against the Jews. And more than a dozen genocides took place around the world, including the “Rwandan Genocide”, which occurred from April 7, 1994 to July 15, 1994. In just 100 days, one-half million Tutsis were nearly wiped out by their own neighbors –- the Hutu’s. Just like the world watched as the massacres unfolded in Central Africa, the world is watching places like Ferguson, MO where young Black men are gunned down across America. Crippled by its own government, the Tutsis had no one to intervene – until it was too late. 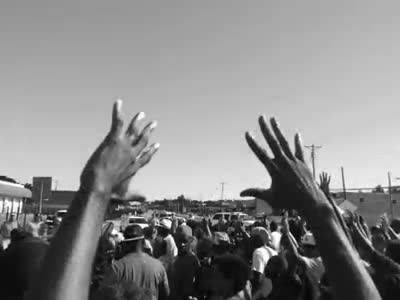 American government forces were eventually deployed to stop the civil unrest and massacre – but not before 500,000 – to one million bodies lay over every inch of land once inhabited by the victim’s.2 Proper and quick government intervention is a necessary safeguard in the Ferguson plight. The call is for Martial Law. The American government must take responsibility. Otherwise, the perpetrators should be subject to the Tribunal Court of law, instituted as a result of the “Rwandan Genocide”. No other human being should have to suffer emotional and physical pain along with economic loss and disenfranchisement. Nor should the bloodshed of the innocent lives of Black men continue. No mother, wife, or child should have to witness or hear repeated conversations — or even worse –see the saddened faces and hear the cries of their family over loved ones gunned by those who are sworn to serve and protect. Properly trained and retrained White law enforcement agents should be a priority on the agenda to stop killing our Black men. The job to serve and protect is dangerous. This is widely known. If fear is going to cause White men in uniform to kill everyone who makes them afraid, they should be prevented from joining the ranks of the police force. This job is for strong, brave human beings. Fearful individuals should not be welcomed to protect and serve our communities. Unless perhaps, there are other reasons for joining the police force. If those reasons are to annihilate a nation of people under the guise of “protect and serve”, that plan is now exposed and must come to an end — immediately! And while law enforcement receive new training, I challenge every Black man and every Black child to have a dream to be purposely and adequately trained to become more than an athlete; but dream of becoming the president of the United States. Dream of becoming a lawyer, judge, police officer, political leader, prosecutor, CEO, journalist, writer, producer, teacher, university professor, scientist, medical doctor, manufacturer, inventor, and most of all, a God seeker. There is nothing wrong with being an athlete; but during retirement or an unforeseen incident, such as a traumatic injury or loss of a contract, Black men and women will have something to fall back on. Whatever door opens to you, walk in! Take your place! Your future depends on you to come up! And do more! The Ferguson upheaval should not be another “business as usual” event or casualty of war among civilians and the government; nor should it be the result of racial divide. I ask, “Who will step up?” Who will take the wheel of justice to stop the violence and assassinations?” If not the government, then let us presume, “They will”. And they, (Black Americans) will do whatever they know to do. Why would you expect something different? And the same thing will garner the same result -– ”a repeat performance of “business as usual”. Want a different outcome? Provide jobs, proper education, clean streets, community recreation, and most of all — kindness and respect for Black life! Give back the dream to have life, liberty, and the pursuit of happiness. This dream is an unalienable right transcripted into the document of the Declaration of Independence, which was established July 4, 1774. Before I close, allow me to offer this: Long before I became a Christian writer and minister, I was a journalist. I studied American and International politics with a focus on the maltreatment of people in the legal corridors and other systems of the world. Now, that I am a Writer with a focus on the church, I do not only get assignments to write about the church or to the people within the church. I write whatever the Holy Spirit leads me to write and whatever will soothe, educate, and cause a conversation to make change –- in the heart of those who want to pursue change. And I am in no way, saying the Holy Spirit led me to write this article, but I am a concerned American citizen expressing my ability to share my concerns and the concerns of others who have already expressed it, about the killing of Black men in this country. My writing will always anger or enlighten, as it did while working as a journalist. But either way, my writing serves a purpose that at times, may or may not, propel positive thought and urgent change. The change must happen in the heart of every man before he can understand that God is in control. And as long as alien forces continue to control man without the wisdom of God, we will always be seeking answers to a repeat of the same performance. And when things quiet down, we will always go back to business as usual. I pray for change. And that that change will be a total surrender to God Almighty! We have a need to change our positions. The power to change is in our hands. God has given us the authority, power, and permission to pursue change! And He will guide and protect the direction of that change. Let us rise up together in peace! Leave the comfort shores of individualism. The hard work of reparations has been in the hands and on the minds of Black Americans for a long time. And it will continue to be a long while before more headway is made. Pursuing repayment for all the social ills to a nation of African-Americans has been an uphill battle. While I strongly believe the fight for reparations should continue, I also believe that reparations in no way, can heal the pain from murdering our Black men, women, and children who were once enslaved. Therefore, we must now remove ourselves from business as usual, and come together in one place to put an end to ongoing genocidal acts against our Black men. We are no longer enslaved! We have built American railroads, tilled the grounds, pastured the animals for food, cleaned their buildings and homes, served, educated, prepared food, and cared for their children and families, served on military frontlines, promoted and advertised their goods and services, purchased their goods and services, convinced consumers through their ads and commercials to repeatedly buy their goods and services. We have played in their sports arenas and have acted in their movies, stage plays, sitcoms, and performed in concert halls and on tour. We have also casted our votes, made medical history and manufacturing discoveries, and have contributed in more ways than none to support this country. We have caused wealth to come to those who show little or no appreciation or respect for our contributions or our lives. We have done our part, stood our ground, and have prayed for everyone. Now it is time to stand together, band together, love together, and come together in one forum. We must shut it down! Debilitate their wealth! Let our absence from there (our old way), and our presence to here (our new way), be made known. We must show people how to treat us. Through peace, first, and then through reinvesting in ourselves, we must show up! Our finances must follow! Together there is power! Separately, there is weakness! I challenge and call out all Black Americans to come stand for solidarity and peace, but also to be heard once and for all! I call out love, and I challenge the following people to show up to: Stop the Genocide! Life depends on it! And all Caucasians and other ethnic groups who dare to stand with Black Americans! This affects your life too! 1 Facebook, (August 21, 2014). 2 Totten, Parsons, Charny, (2004) “Century of Genocide”, Routledge. ← The Tongue of a Ready Writer!